Queen City is more than just a sailing club. We enjoy our beautiful club and our beautiful location as much as possible. Our full restaurant and bar operates during the sailing season and is open to members and guests. As well, the club is available to be booked for events such a weddings and receptions. Contact the restaurant manager for more information. Many big events are scheduled throughout the summer. Find out all the details on the Entertainment Page. The Clipper, our official club magazine, is published several times during the sailing season. It contains member-generated content, articles of interest to our members and important news about the club. 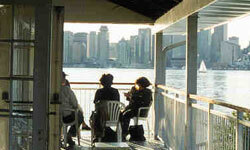 Many of our members capture the fun we've had at events or club cruises in photographic form. We are always adding new galleries full of the best photos. As one of the oldest clubs in Toronto, we have a rich history on display in our trophy case. The Awards Banquet is one of our biggest events of the year, so it gets its own page on the website. We award many racing, cruising, and social awards each fall.